If you’re professional photographer Mark Laita, you keep calm and take a picture of the entire process, thus securing not only an amazing shot but also proving your iron will and sheer testicular fortitude. Laita’s new book, Serpentine, arrived for me in the library today and I could not be more excited. 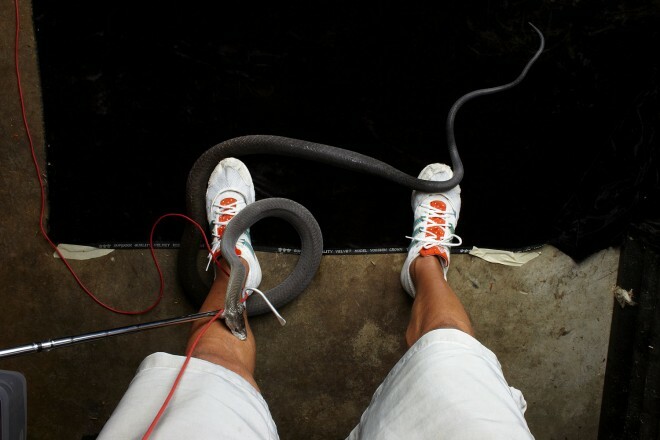 It is, without a doubt, the most beautiful collection of snake photographs I’ve ever seen. This is a book that I need to own, not just so I can admire the intricate beauty and color of his subjects, but also because any man willing to endure this for his art is a man who deserves my money. Damn it, I knew I should have worn jeans today. In case you were wondering, it only takes about 10 to 15 mg pf venom to kill a human adult and the mamba’s bite delivers about 100–120 mg of venom on average. So, you know, God help you if it bites you.